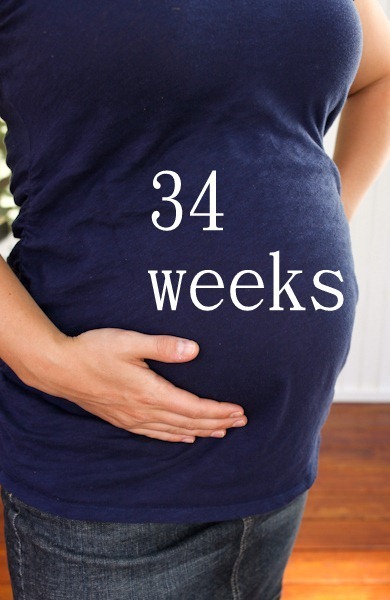 34 Weeks: Drop Or Not? 34 weeks feels like another huge milestone. According to some of my doctor friends, the chances of the baby needing lots of respiratory care if he were to come are now slim. Also, my hospital, Martha Jefferson, allows mothers from 34 weeks on to labor there (otherwise I would have had to go to UVA, which has a top-of-the-line NICU), so that’s a relief as well. Of course nothing is guaranteed, but I’m very thankful to have made it this far along. I definitely grew out a bit in the past week! In fact, I thought that the baby might be dropping a bit because I’ve felt quite a few bangs down there that kind of took my breath away. I’ve read online that babies can drop a little bit at a time starting pretty early, especially for first time moms, so this wouldn’t have surprised me, but my doctor said his head didn’t feel like it had descended – rather I probably had some pelvic floor spasms! There’s definitely more pressure down there in general though, and my stomach feels heavier. Another reason I thought he might have dropped some is because my burning rib pain (which doctor says is common – muscle spasms that feel like tingles and/or burning under the ribs) nearly went away for a few days! However, they were back with a vengeance the other night, I think I just did something to let them rest. And being on my feet too much Saturday night brought them back! The only way I can get relief from this terrible burning (which unpredictably comes and goes) is to lie on my left side. At least I know of a way to find relief. I’ve started sitting on my exercise ball (which I bought just for pregnancy) while I work. I think this is helping with my low back pain. I went back to the dining room chair for a day and the pain came back strong, so ball must be helping. Not to be indelicate, but I sit on it with my legs spread open – also to encourage good pelvis position! And my doula says it’s best for the back + pelvis to sit with the knees lower than the hips, which happens on the ball. My doctor felt the baby’s head right in the middle of my pelvis and said it was in a great spot, so I’m encouraged that things are aligned. Oh how lovely – a peek inside a maternity skirt! I’ve also had to change the way I do some movements this week. Things like pulling up my pants and standing up from sitting on the floor or squatting – if I don’t do them slowly and with good form I really hurt my lower back. I used to think that the tough part of being pregnant was just having a basketball on your front, but I’ve realized how much the structures of the body change as a result of the basketball. Rolling over at night isn’t hard because of my stomach but because of my hips, back, rib muscles and abs always hurt. Standing up isn’t hard because of the weight or balance redistribution but because of my hips, back and ab pain. Everything is just loose and shifting around in there and there’s a pain somewhere all the time. I look at the other women in Body Pump and wonder how I ever had the stability to do planks and lift heavy bars! I sure hope I can get that back. The baby is really hard in there – meaning I feel his body so firm against my skin all the time! My favorite moments are still those when his knee or foot or leg pokes out – always on my upper right side. He loves to poke them out when I walk! Or when I lie on my left side. We still do lots of playin’ together : ) You’ll find me with my right hand on my stomach all the time. Ribs and back aside, I’m feeling really good. Still sleeping well, but a bit more tired in general, which I hear is normal around this time. I have little desire to do much more than walk, yoga and lift weights, although I have gotten a few cravings to burst out into a run! Not sure how that would go – lol. I’m finally starting to feel “huge,” like a turtle shell is strapped to my front. I can still see my toes and shave my legs no problem though, so we’ll see how big I get! You look great! I hope you get to deliver at your choice hospital. As little chaos as possible! The stability ball was my best friend…I bounced away on that thing every day for two weeks before I delivered (my doula also said it was beneficial to loosen the pelvic area/uterus). As for that “dropping” feeling…it gets worse! I felt like my son was going to literally fall out for a week before I was due!!! I got those running cravings as well! I would see women running and desperately want to join them! You look great! And if you can believe it, that baby still has more growing to do! I love the last picture. You look adorable! Ah, how exciting – so close! You look AMAZING! And love your skirt! You look like a lovely happy pregnant lady! Thanks for all the posts and your skirt is very cute! You are looking super adorable right now, and that navy blue is very flattering! You look beautiful! I love in-progress photos, so fun. If you don’t mind me asking, would you mind doing a part of a post on your doula? How you found him/her, why you chose to have one, what they’re doing/will be doing? I don’t know many people that have used one and am curious. Yeah, perhaps that might be a good one to do after the birth so I can talk specifically about how we worked together? I will look forward to it, thanks! That would be a great post! You can keep using the stability ball after you have the baby-my guy loved being bounced on it. He would go from freaked out to calm whenever I held him tight and bounced a little up and down. It felt like we were playing together when he was too small to really play with. I was so jealous of runners when I was really pregnant and they seemed to be out enjoying a jog. I just kept reminding myself, I’ll be back there all in good time. You will be too-you look great and have been good to yourself. You look fantastic! And by the way, I’ve learned a lesson: I should not read BERF (and look at your pregnancy pics) right before I go to bed. Last night, I had a nightmare: that I was pregnant! I’m 53 years old (with 2 grown sons). Yikes! Not a good dream for someone my age. You are totally all tummy.. definitely looks like a basketball! And I can’t even imagine the pain.. but I had no idea! But i mean you are growing a human being sooo I can only imagine..
You look so cute in your skirt! Love it :-). Can’t wait to meet Baby Kerf! Hopefully later rather than sooner, though… Gotta keep that baby bakin’ for as long as possible! 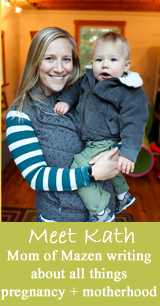 I’ve been pregnant 2x and have had lots of the same aches and pains you describe. I have said both times to my husband on numerous occasions, “am I really going to feel normal again? Really? Are you sure?” Because at the time it all feels endless, but rest assured, you will 🙂 Just today i was getting my 18 month old out of the seat on the back of my bike and the thought came into my head that i remember trying to do this with my older daughter while pregnant with my second. It was sooo hard to push the bike up the driveway and take her out. Finally, I would only go for rides with my husband because he could put our daughter in and out. And i stayed active my whole pregnancy, too. But, of course, today i was able to do it no problem! I’ve never really understood the ‘dropped’ discussion; if I was the guide, I never looked like anything dropped – it was all pretty darn high; and then I went from 5 to 10 cm’s in…an hour 🙂 So it dropped real fast. Lol And then I see other women walking around from like 7 mos on, and they look like they’re carrying that baby around their knees they’re so low…I just think it’s all so unique to our bodies. You’re going to have a great birth – I know it. Some women don’t drop until they are in labor – my guess is you were one! I didn’t drop either. Have no recollection of any baby dropping until I let you fall off a bed when you were eight months old. I still feel bad about that! Oh geez, I don’t remember that! He still looks high to me! But maybe lower…. My first dropped earlier, like around 34wks or so. My second dropped much later since he was breech until 38wks. Once he flipped head down he was DOWN. So low that I had tons of swelling ‘down there’. Not comfy. But at least I could breath haha. Wishing you and your growing family SO much happiness, Kath! I’m so glad to hear your little one is all head down and in a good position! When you were describing the rib pain and low-down kicks I worried maybe he was breech because that’s just what my little girl felt like and she wound up being upside down. I guess no matter which end is up it just all starts to get a bit uncomfortable when you’re growing a person and he’s running out of room! I remember feeling like all the discomfort was so minor compared to the amazing experience of being pregnant. I took it easy, did light yoga and walking, and just felt so darn peaceful most of the time. I wonder sometimes how different it will be if I’m expecting again soon (which I hope to be) — this time while chasing a 1-year old around. I’m guessing there’s just nothing like that 1st pregnancy when you have all the time and energy in the world to focus on your experience and all your hopes and dreams for that new little person about to enter your life. The low down hits don’t feel like feet – more like a rock of a head! His feet are always up on my right side – under those ribs! They were her feet under my ribs as well! She was frank breech with her feet stuck up by her ears so she could barely move. My doc said the banging I would feel down low was her hard little bum! Make sure and keep that exercise ball handy after the baby is born. It is a great way to bounce them to sleep – sitting on that and gently bouncing up and down is easier on your back – and you won’t trash the edge of your matress like my sister did! I actually labored on that ball for quite some time in my second pregnancy and it was amazing. I sat as you described and kind of rolled around on it circling my hips and bearing down a bit during each contraction. It was very helpful! Ah wow, 34 weeks. I’m only 21 and feel like I couldn’t possibly get any bigger. Gulp. Best of luck with your aches and pains. Treat yourself to lots of fun things like massages and other pampering splurges. That’s my advice, for what it’s worth. Enjoy! You look beautiful. You have the glow of a woman who is awaiting a blessing. 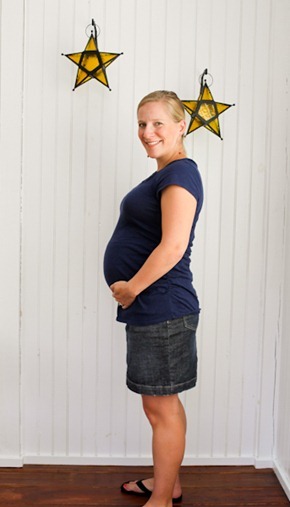 Love the maternity skirt! I am so glad i am pregnant today and now when our moms were pregnant with us. My moms maternity clothes persisted of moo moos and my dads clothes! Man, that burning rib pain sounds awful! I hope it goes away again soon. I need to invest in an exercise ball. I used to have two, but I have no idea what happened to them. Yes, isn’t it crazy how the entire body shifts for the growth of the baby?! I remember reaching a point where my body felt strange to me, like it was no longer my own because not even my movements felt familiar. i know you have been wanting to get the huge, full belly of pregnancy-as i hope to have some day as well-and it hasn’t come as quickly as you hoped. well, it looks like it is here. you’re belly is huge! haha this is pretty much the only, only, only, time a woman ever would want to hear that! but you look great. also-my sister used an exercise ball to bounce with her baby the first few weeks to get him to calm down and go to sleep. i mean she would really bounce up and down and scare us but it worked!! Haha – feels like it too! You may have posted about it before, but I’ve got preggo brain, and don’t recall… where is that skirt from? It’s the perfect length & the perfect color… I want! 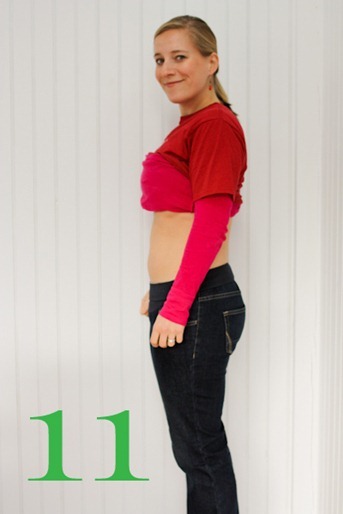 As my stomach keeps growing, it is more difficult to bend over, put my shorts or pants on, etc. The lil’ guy in my belly is only 3 lbs. & something, but they said that I have a lot of fluid. So, that is why I feel so big. I have the same burning rib pain that you are describing in the same exact spot (I’m due 9/4), but it is an inflamed gallbladder. Laying on my left side takes any pressure off of it, and I feel better. Cutting out gallbladder-problem foods also helps. I’ve had with all 3 of my pregnancies, and it goes away after delivery. Just an alternative thought of what the problem could be. I've decided to moderate all comments on Baby KERF to protect my family. I ask that if you don’t like the intimacy of the blog, please just step away. Opinions and discussion are welcome, but comments that are disrespectful, rude, judgmental or mean spirited will not be published. Please respect me, my family and those who choose to come here. 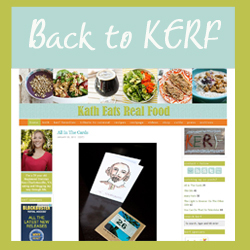 Please take note that many of the links on Baby KERF are Amazon Affiliate links. Thanks for your support!